Annabelle Comes Home release date is set for Friday, June 28, 2019. This will be a Nationwide in theaters release. The third installment of New Line Cinema’s hugely successful Annabelle films starring the infamous sinister doll from the Conjuring universe. 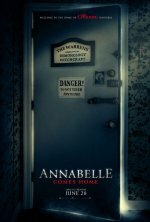 changed the title from "Annabelle 3" to "Annabelle Comes Home"